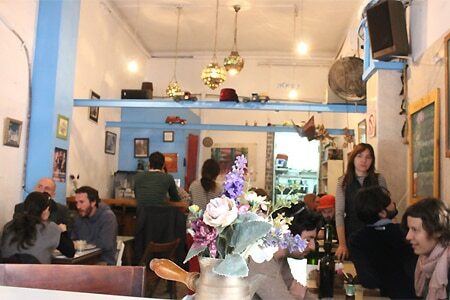 A bohemian coffee shop, serving spiced Turkish coffee and robust vegetarian dishes. : Caffe Kaymak is located in the heart of the Levinsky market, amongst spice shops and fresh olive merchants. Turkish glass mosaic lamps hang from the high ceiling, and seats at the bar of the open storefront facing the street provide for optimal people-watching. Piquant vegetarian dishes are directly influenced by the baskets of herbs, spices, nuts and dried fruits from the vendors in the neighborhood and are inspired by the variety of ethnicities in the country. Breakfast dishes include homemade breads, labneh and zaatar, and fresh table olives. Revolving lunch and dinner selections include spiced fava beans, homemade couscous with stewed vegetables, or Moroccan spiced chickpea soup, just to name a few. Waiters are often known to walk around the café pouring patrons free shots of Arak, accentuating the communal, neighborhood atmosphere. Whether for a coffee break, a refreshing boutique beer or a stop for lunch, Caffe Kaymak is the "crème de la crème" of café culture in Tel Aviv.